Fabio Lopez is a Spanish artist who goes by the name of Dourone . He came to art when he was just a little boy, going to the shop with his grandma, he would stop and look at graffiti in the streets of the little place of Alcorcon, in the suburbs of Madrid. He liked to draw, and he made his first painting alongside his uncle who visited from France. Dourone finds it difficult to get by on one’s own in a culture where art is difficult to live by. He recognizes himself as an artist when his piece is finished and he can confidently call it his own, surpassing challenges of not getting anything new every time. Before finding his own style, he experimented and realized he first needs to learn how to draw. Later, he tested his skills through painting, graffiti, sculpture and decoration. 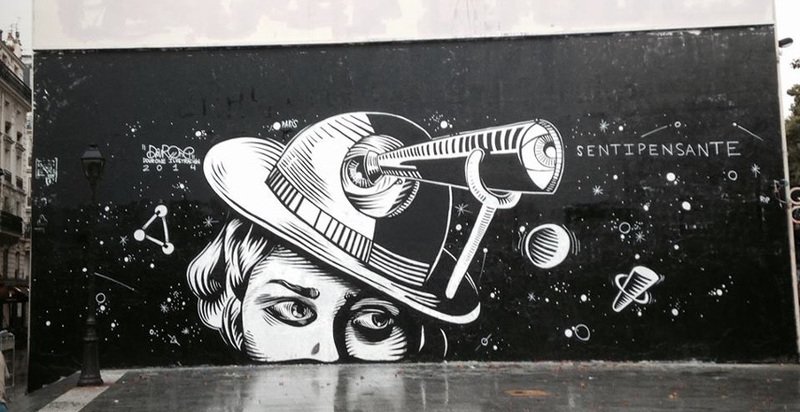 Dourone is still trying to define his style, and he finds it most relatable to the word sentipensante originating from the Uruguayan writer Eduardo Galeano, which combines thought and sense. One of the most inspiring motifs for Dourone is the contrast of light which depicts perfectly both the separation and the union. Aside from this, he finds his inspiration in all the different and often little things, like people he gets to know on the road, a mere conversation or a meditation that took place. Dourone started making graffiti in 1999 in Madrid, and since 2012 he has been working with Elodieloll. 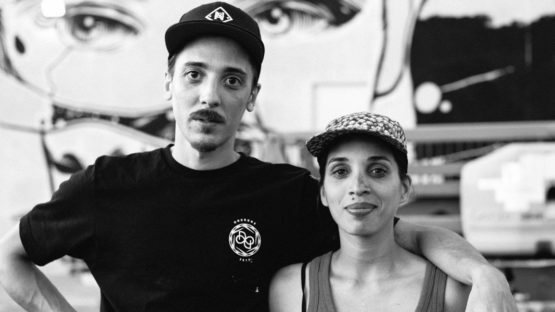 The duo travels the world creating monumental murals in some of the largest cities in the world, such as Los Angeles, Miami, Paris, Amsterdam, Kiev, Johannesburg, and Marrakech. Realistic or surreal, Dourone’s artworks are figurative, combining colors with illustration, clearly signing the recognizable style of the two artists. One of the prominent motifs in their work is the female portrait. It always portrays a picture of responsibility, solidarity, creation, non-duality, wholeness and infinity. After a long American road trip in 2015, Dourone reconnects with the studio surroundings, transposing his pieces on canvases and in volume. The duo decided to produce their pieces mainly in blue and orange during 2016 because these colors appear in the sky every day. This choice made 2016 an aesthetic turn for their style. 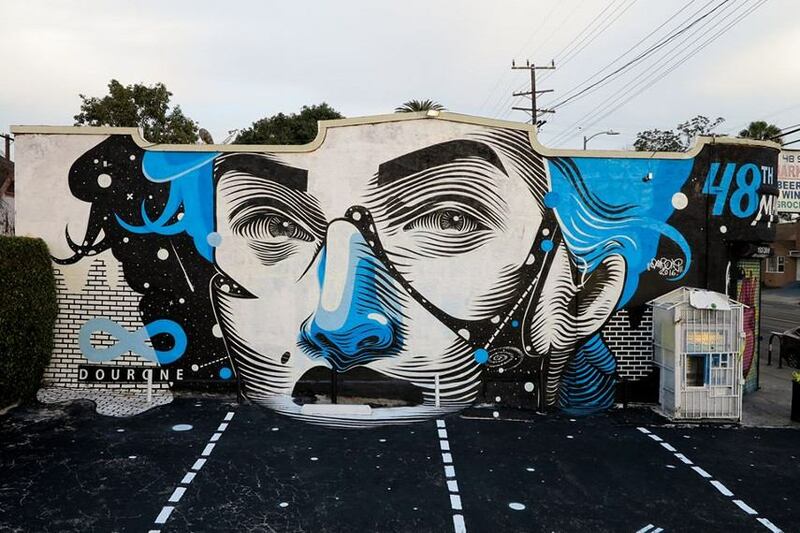 Freedom, respect, and diversity are the foundation of his art, as Dourone tries to convey them through his pieces, his goal being to create a quality education. These humanist ideals are revealed in his art, which continuously question the place and responsibility of the man in this world. This Spanish artist amazes us with his works such as the 38 meter high murals and his first solo exhibition Shining Shadow. Dourone is repreented by Orlinda Lavergne Gallery.